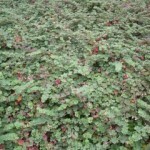 A spreading groundcover with crinkled, dark green leaves, white flowers, and a burgundy winter color. It will produce orange-red fruit that resembles a raspberry. It takes heat and drought but does well in shade, too. It will cascade over rocks and ledges, and can form a dense, low mat. 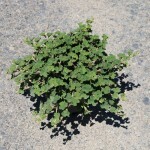 Also known as Crinkle-leaf Creeper or Raspberry Creeper.